• At Le Poisson Rouge, New York City, on August 17 and at the Foo Fest in Providence RI on August 18. See Calendar Page for details. • The MonkeyNet Tour continues on to Italy in September. See dates at the Calendar Page. Tony Maimone will be joining the band for this tour. • The new Pere Ubu studio album, 20 Years In A Montana Missile Siol, released September 29 2017 on Cherry Red Records. For the press release, scroll down. • The last of the planned vinyl box set releases, Les Haricots Sont Pas Salés,' is released April 6 2018. The box includes The Tenement Year, Cloudland, and Worlds In Collision. A bonus disc of out-takes and studio mixes,'Songs From The Lost Album,' is also included, as well as a poster by John Thompson. Ubutique will be offering it. The West Coast portion of the MonkeyNet Tour (Nov. 30 to Dec. 8) had to be cancelled for medical reasons. One band member had a serious episode of the flu. This infected David Thomas, causing severe complications. He was hospitalized at the end of the East Coast portion of the tour. His doctors refused to okay his release and warned in the strongest terms that to continue the tour would have serious consequences. David relented. Paul Hamann died September 14, 2017 in a Cleveland hospice. He was 62. He engineered nearly every Pere Ubu album since 1980 at his studio, Suma (Painesville OH). His father, Ken, who died in 2003, was the band's engineer/producer before retirement in 1979. Paul, like his father before him, was one of a kind. Over the last year and a half he struggled against a range of cancers without comment. He worked to the end. As we recorded the last Pere Ubu album I could see he had reached a unique level, burning with inspiration and ideas. In the coming weeks and months there will be opportunities to write more of Paul. The abiding memory I have is the hours we sat in the control room, silently working, listening. An event would pass by on tape, I'd shoot him a glance, he'd adjust something on the channel control strip, I'd make an approving noise and on we'd go without further exchange. There were no words needed. And now there are no words adequate. 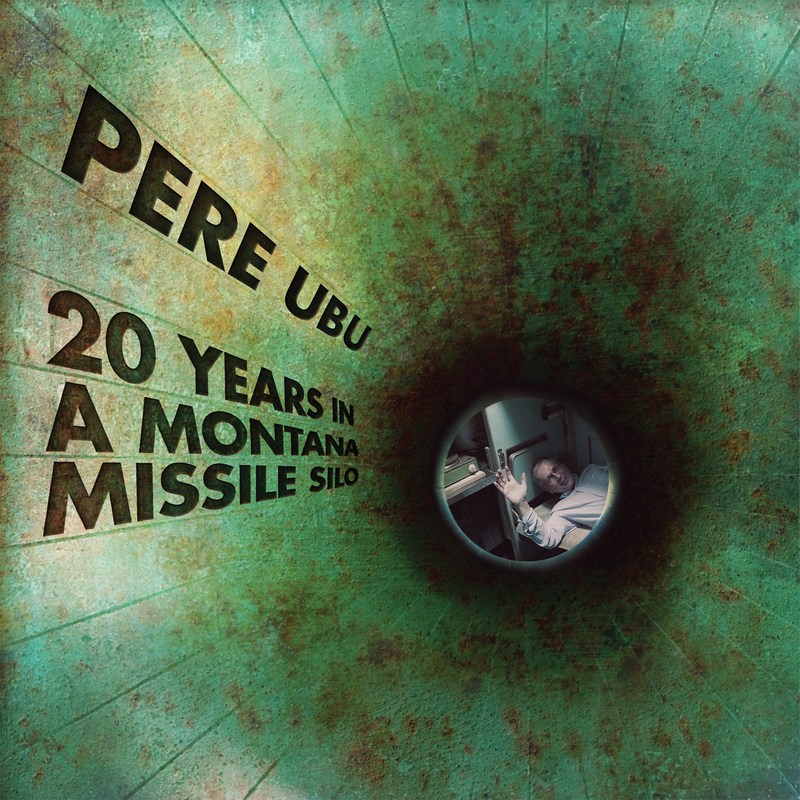 Pere Ubu's new album 20 Years In A Montana Missile Silo opens the doors of the avant-garage to reveal the hardworking mechanics hammering away at the fundamentals of blue-collar rock. A three-guitar revision spans the state of the art for guitar-based rock in the year 2017. Keith Moliné is joined by Cleveland guitar legend Gary Siperko and Kristof Hahn in the now familiar orchestra of analog and digital synths, clarinet, drums and Thomas' unquestionably unique vocals. It follows on from their release in 2015 of Carnival Of Souls, which was widely praised by the media, confounding the usual clash of critics' sensibilities, and chosen by cult series 'American Horror Story' to provide two soundtracks for characters Mordrake and Twisty, in Season 4. The album was recorded and mixed at Suma, Painesville Ohio. Engineer Paul Hamann, and his father before him, have been part of almost every Pere Ubu album since 1976. Thomas and Hamann have explored innumerable production methods over the years, establishing the unique Ubu sound that pre-dated punk and still stands proud of the forced genre defined clichés of the music world. Over the years, Kristof Hahn had become a regular visitor to the Ubu dressing room during his time-off touring with The Swans. He was given access to the songs from the new album as works-in-progress. "I was just listening to 'The Healer' again today and it gave me goosebumps," he wrote to Thomas. "The whole album sounds amazing already, I would be really proud to be part of it, however small my part might be." He was brought on board immediately. The touring arm of Pere Ubu will be heading out with the new album; first-off in the USA in November-December, amd with a full European tour and further USA dates in 2018. Mr Thomas has written some detailed notes. We identified a problem with the packaging on the box set, 'Drive He Said,' and as a result, the release date has been changed. We have been told that replacements will now be available for us to send out to pre-sales orders on the 17th March. Please note that this revised release date is being extended to all pre-orders through ourselves as well as all other outlets, such as Bandcamp. We're not pleased with this delay and, as such, we feel it appropriate to offer all those who have pre-ordered the opportunity to have their money refunded. The offer of the free 7" colour vinyl of 'Slow Walking Daddy' stands for the revised date and is available for all orders received by us so far. If you would prefer a refund, please reply by return and we will ensure the funds are transferred back to you via paypal. If you're happy to wait the extra ten days, we'll see you then. Rocket From The Tombs and Pere Ubu at Austin Jukebox, May 19th and 20th. In the lead up to the West Coast Coed Jail tour in June of 2016, David Thomas told an interviewer that he'd like to play 'some town out in Texas.' Austin Jukebox approached Ubu Projex earlier this year and the date has been set for an (almost) unique weekend of back to back Avant Garage with both Rocket From The Tombs and Pere Ubu in one weekend. On Friday, May 19th, Rocket From The Tombs will take the stage at Beerland in Austin, Texas, as part of the events organised by Austin Jukebox; a quarterly series of shows that provides a platform for local bands whilst showcasing one-off appearances of iconic bands and artists to produce "interesting, cool and, most of all, not boring shows." RFTT will play material from both the back catalog and the most recent album, 'Black Record' (Fire Records, 2015). The following night, Pere Ubu will take the stage with the 'Coed Jail' set of songs from 1975-82, which were recently issued in the two box sets 'Elitism for the People' and 'Architecture of Language' (Fire Records). In 2003, Rocket From The Tombs played Houston but Pere Ubu have not visited the state of Texas in over twenty years. The RFTT/PU collaboration has only happened once before at Disastodrome at the UCLA in Los Angeles, 2003. Formed in 1974, by August 1975 RFTT was burned out and gone. In less than a year it blew through four different drummers and never went into the studio. Left behind were live recordings of songs that would become anthems. Thomas and Laughner went on to form Pere Ubu, taking the songs 'Final Solution,' 'Life Stinks,' and '30 Seconds Over Tokyo;' songs that were to become iconic in the new wave that would influence many bands thereafter. 40 years and 40 albums later, the two bands are still recording and touring. Pere Ubu continues to expand. That's the plan. One of the goals of David's last Five Year Plan is The Pere Ubu Orchestra. As far as he's concerned the only limit is phynance. Cleveland guitar legend Gary Siperko is the latest recruit (well, almost - there is a new member lurking in the wings). That doesn't mean that Keith is replaced, or out. It means that David wants to expand the Guitar Corps of Pere Ubu, as he did with the Synth Brigade. Everything is to expand. David has been studying the life cycle of the slime mold for inspiration. Communex has produced a 158-page, A4-sized paperback book chronicling the years 1975 to 1982, "gathered from the debris." "It wasn't supposed to last for more than one single - one gig - one album - one tour... As told by the band themselves and the people who watched them." Book designed and compiled by Commuynex. Cover designed by John Thompson. The studio albums contained in the Architecture box will have individual releases on cd and vinyl at some point, but not right away. The extras disk, 'Architectural Salvage,' will not. 'The Hearpen Singles,' from the Elitism box, will have a cd and vinyl release soon. The 'Manhattan' disk will not. There is a special vinyl release in limited edition prepared for National Record Store Day. Box 3, as yet untitled, will be the Fontana years albums but negotiations are not completed so Box 4 will come out next, sometime in the September/October region. Box 4 will be the time period of 'Raygun Suitcase,' 'Pennsylvania,' and 'Saint Arkansas.' RGS will not be re-mixed. PA will be remixed because the digital technology used to record it was too limiting on the mix stage. STARK may or may not be re-mixed - the jury is out and vacillating. At some point there may be an all-inclusive Pere Ubu live box. 2. The albums are being prepared 'for posterity.' That means the box sets, and subsequent individual releases, are the end of the line. They are the final and permanent representation of what was supposed to be going on. We are using cutting edge technology to prepare them. It's unlikely many members of the band will be alive when any more advanced technology makes a reconsideration possible. 3. The boxes will not contain any historical notes or commentaries or associated ephemera. The albums stand on their own. In 2015, in order to express solidarity with Pere Ubu, RFTT renounced its 'US citizenship' and applied for creative asylum in Port Talbot, Wales. In 2014 Pere Ubu renounced its US citizenship and moved to Leeds, England, after a cabal of the American Federation of Musicians and a clique of government clerks in a small town in Vermont determined that Pere Ubu was unworthy of being granted permission to perform in America. On August 21 2015, Fire Records released a box set of four vinyl lps caled 'Elitism For The People, Pere Ubu 1975-1978.' It consists of 'The Modern Dance,' 'Dub Housing,' 'The Hearpen Singles,' and a live set recorded at Max's Kansas City in 1977 called 'Manhattan.' Also in the box are a reprint of the 'Datapanik '77' poster. Included are codes for free audio downloads in the MP3 (VBR), MP3 (320 kbps), FLAC, Apple Lossless, AAC (iTunes), and/or Ogg Vorbis formats. Purchase allows unlimited streaming via the Bandcamp app. 'Elitism' is also sold as a digital box set. Paul Hamann at Suma digitally transferred the original quarter-inch two-track analog master mix tapes at the highest resolution available, 192khz / 24 bit. That's more than four times the audio resolution of CD music. The vinyl was cut directly from those files on the best lathe Neumann manufactured. The down-sampling necessary for cd production and audio download files was accomplished after a two year study of the 'black arts' of the realms beyond human hearing. The result is probably the best fidelity that's been commercially produced and as close as can be achieved to audio transparency between the various media. All releases are available in all territories. An April 18 2015 release of the box set in conjunction with National Record Store Day was limited to the UK and EU. Fire has also released individual cd, vinyl and digital album editions of 'The Modern Dance' and 'Dub Housing.' Purchase includes free download audio codes and unlimited streaming via the free Bandcamp app.